Sharma Billiards has emerged as a trusted manufacturer, supplier and exporter of a varied range of products. The range of products that we offer to our clients include Snooker Table, Billiard Table, American Pool Table, Lion Foot Pool Table, Customized Pool Tables, Air Hockey Table, Imported Soccer Table and many more. We here by present ourselves as a leading manufacturing in English Billiards Table & Accessories. Our loading docks to load and unload goods from trucks are well-maintained by the professionals; with completely automated warehouse that is sternly supervised. Thus, we make sure that products are kept safely. As we promise to offer quality approved products to the clients, we make use of only high-grade raw materials selected from one of the best sources present in the market. 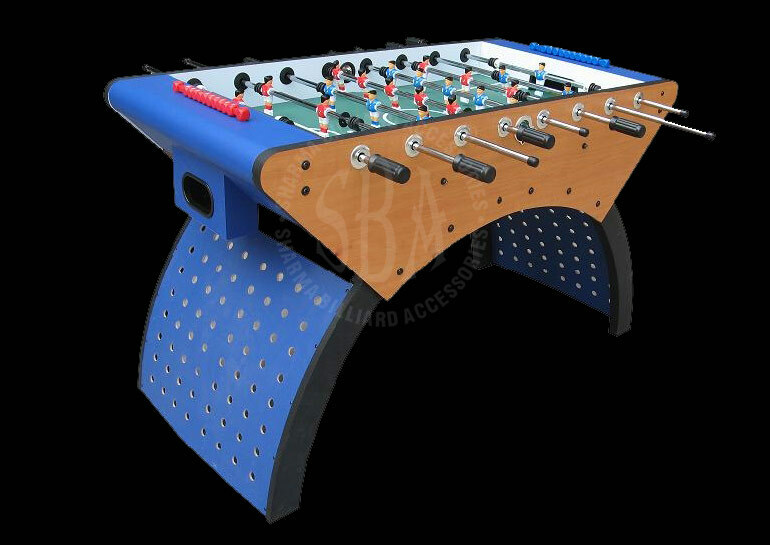 Solid wood material, with MDF + PB Board Laminated with Graphic Ovel Shape side apron, latest design legs and players with handle grip, hollow steel rods Three man goalie with cushions system, Mounted with manual scoring, all accessories inclusive.